The Dayton Power & Light Foundation and DP&L Company are awarding a $5,000 grant to the city of Urbana to upgrade the electrical system at the Melvin Miller Park stage. Two items pertaining to school infrastructure took center stage during Tuesday’s Urbana City Council meeting. Council member Al Evans addressed the ongoing situation between officials from the city and Urbana City Schools over whether the city or school district is responsible for building and/or improving the road to the proposed site of the new pre-kindergarten to grade 8 building on 60 acres the district owns next to the Champaign Family YMCA on Community Drive. Urbana City Schools Superintendent Charles Thiel said previously the district had thought to extend Community Drive north to the building site, but building a road and extending utilities may exceed the district’s estimated costs. Urbana City Schools voters approved a 7.15-mill bond issue in November 2014 to build the pre-kindergarten to grade 8 building and knock down and reconstruct the current junior high/high school building on its current site. The $68 million project will keep the “Castle” structure at the high school and fund demolition of the remaining schools in the district if they cannot be sold. Also during the meeting, council, by a 6-1 vote (Council member Dwight Paul voted no), approved the amendment of a contract with DLZ Ohio adding new services in the amount of $10,500 for title and appraisal work related to the Safe Routes to School Phase 2 Project, which involves installing sidewalks on the south side of Boyce Street from East Lawn Avenue to Jefferson Avenue and on the east side of Madison Avenue from Boyce Street to Central Street (back of East Elementary). In response to Paul questioning whether the sidewalks are needed since new schools are being built, Crabill said the city could give the approximately $200,000 grant for construction costs back to ODOT, which in turn would give the money to another entity. Council waived the three-readings rule and passed a resolution authorizing Brugger to accept a $5,000 grant from the Dayton Power & Light Company and the DP&L Foundation. 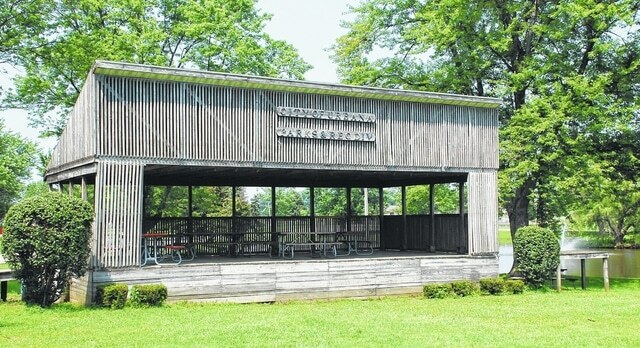 Brugger said the money will be deposited into city’s Park and Recreation Trust Fund and is earmarked for electrical improvements to the stage at Melvin Miller Park. •Nine change orders total $29,465.21 to Kinnison Excavating for part 2 of the Phase 1 Water Main Replacement Project (Wooddale-Amherst). “We incurred some costs that we didn’t plan on throughout the project,” Crabill said, noting the project is in the restoration stage and nearing completion. Crabill added one of the change orders is related to additional street resurfacing of a portion of Amherst Drive (between Wooddale Drive and Bon Air Drive) that wasn’t directly impacted by the water main project. •A purchase order to Corporate Equipment Company in the amount of $16,000 for the purchase of two new pumps to replace the existing pumps at the Street Department’s stormwater pump station on the east side of the West Light Street bridge. •A purchase order in the amount of $13,765.85 to Software Solutions for the annual software license and maintenance support for the city’s financial systems. •A resolution authorizing preliminary approval between the city and ODOT for pavement planing and resurfacing of state Route 54 from Scioto Street to Powell Avenue in the summer of 2018. •An ordinance adopting the tax budget for fiscal year beginning Jan. 1, 2016. “We are looking at a $6.292 million revenue coming in,” Brugger said. •An ordinance amending chapter 141 of the city’s codified ordinance concerning ambulance service rates and charges.